I arrived in Grundisburgh after a frustrating week. I had spent one whole morning, with the permission of the Ministry of Defence, documenting the four churches marooned inside the Norfolk battle training area; these are not accessible to the public, so I was careful to photograph everything I could for posterity, including many of the gravestones in the churchyards. I'd spent further hours formatting the photos, setting the pages up with thumbnails and text, and now the Ministry of Defence had decided that it couldn't easily give me permission to publish them, because it would create too much interest in a sensitive area. So it was with some relief that I came to Grundisburgh, knowing that this welcoming church is open every day, is full of fascination, and is in an interesting village. And they won't stop me writing about it. 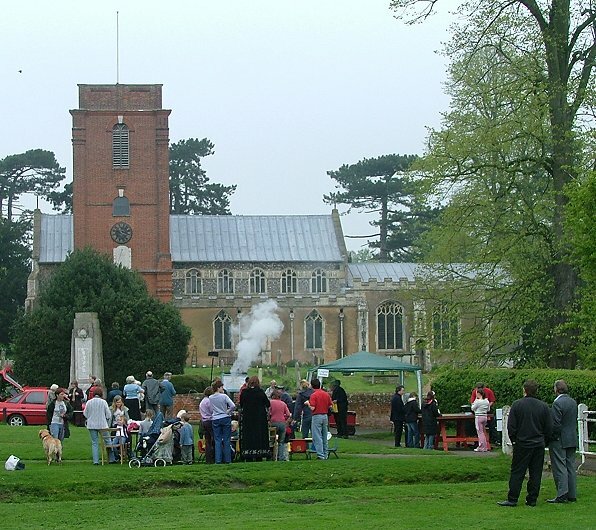 I was here on May Day 2004, and at 10am the village green was already the scene of frantic activity. Grundisburgh has one of the prettiest village greens in east Suffolk; a small triangle with the church on one side, the former school and an old-fashioned shop on another, and pretty cottages along the main road on the third. Two sides of the green are bordered by the infant River Finn, and there is even a ford. The imposing art deco war memorial stands in front of the church, and people were setting up stalls for the May Day fair. Soon, the sound of English country dancing music was blaring out, and there was the smell of coal smoke from a small traction engine. It was very atmospheric. The tower of St Mary overlooked all this. It is a curious tower, to say the least. Suffolk has several other 18th century brick towers, but the pretty red-brick ones at Cowlinge and Layham, for example, do not seem quite so startling, and the white brick tower at Redgrave is elegant and stately. Perhaps it is simply that they are not so severe and bulky; St Mary's looks like nothing quite so much as a municipal water tower. 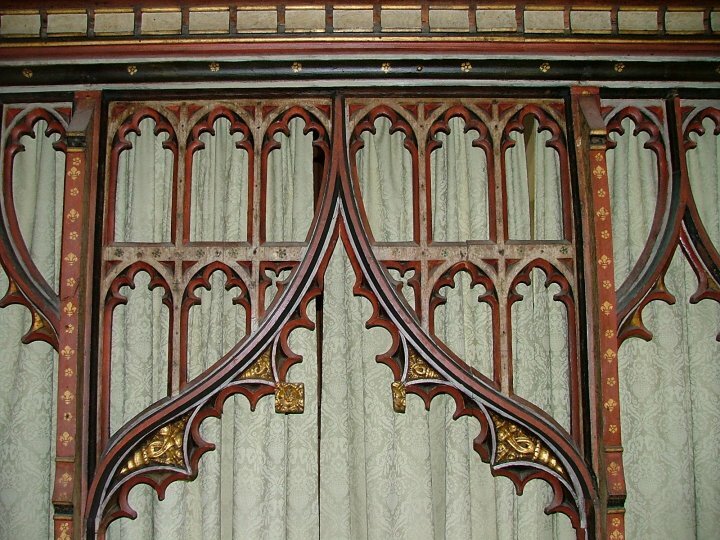 This isn't necessarily a bad thing; Victorian restorer Edward Hakewill wished it in hell, but I was pleased that it existed somewhere, if only here. 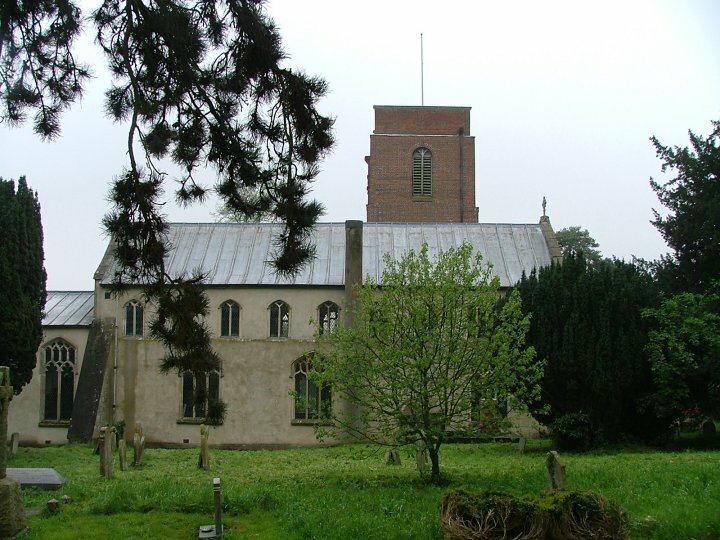 Like many church towers in the Ipswich area, St Mary's is offset in the south-west corner; built in 1732, it replaced a medieval one in the same position. 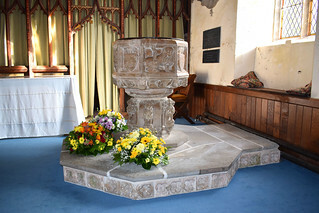 Robert Thinge paid for the work, and the tower was specifically designed for bell-ringing, as at Drinkstone 40 years earlier. Grundisburgh's ring of twelve bells is very highly thought of. 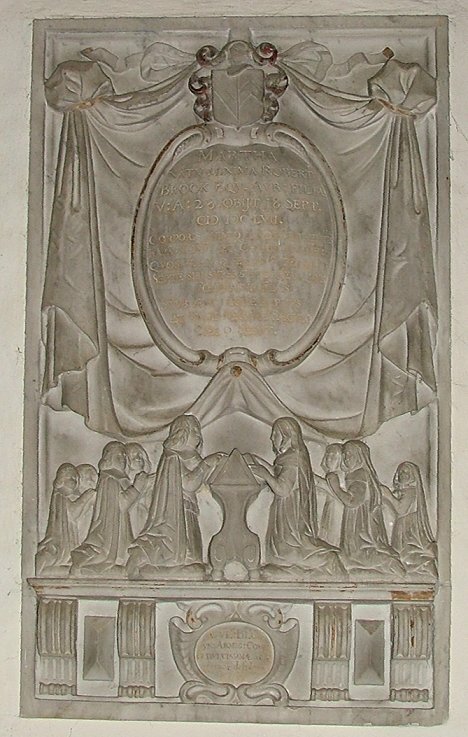 Thinge's memorial plaque has been restored, and sits above the south doorway. About halfway up this side is a wide window which gives light to the bellringing chamber. Beneath it is a 19th century clock to remind us that Tempus Fugit, but I love the intricately marked sundial below it, particularly because it tells us, in Suffolk dialect, that Life pass like a shadow - in Suffolk speech, the third person of a verb is often not conjugated separately. Click on the images below to see them enlarged. Beyond the tower, a typically lovely late medieval church stretches away. The short 14th century south aisle is neat, crenellated and begargoyled. At its eastern end is the chantry chapel of Thomas Wale, built on the eve of the Reformation in 1527, and already demonstrating how an emphasis on secular power was in the ascendant. 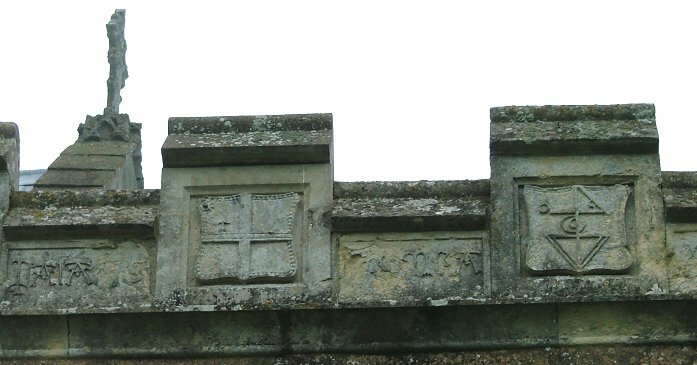 The dedicatory inscription below the battlements asks us to pray for his soul and that of his wife, but the reliefs show Wale's merchant mark, and the shield of the Salt Merchants' Company, of which he was a member. 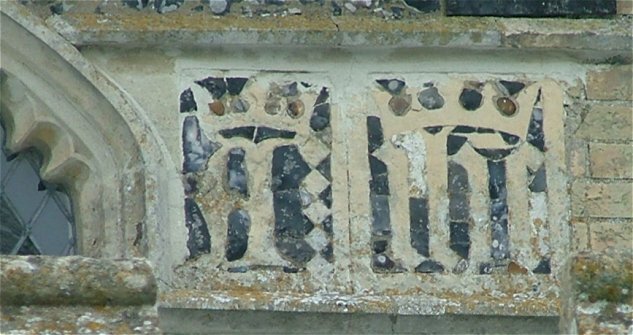 The high, beautiful clerestory is from half a century earlier, and flushwork monograms punctuate the windows; they include the badge of St Edmund, what are believed to be the monograms of Thomas and Anne Tudenham who paid for the work, and letters spelling out AVE MARIA. Click on them to see them below. On this side of the church there is a biblical garden, with plants from the bible and labels with their scripture references, which I thought was a jolly idea. 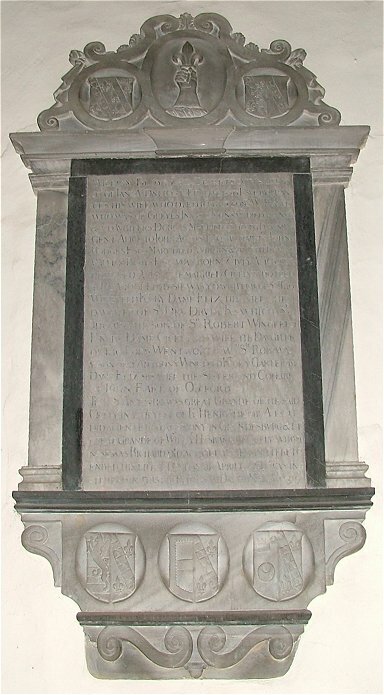 There are some good 18th century headstones and a flotilla of tombchests to the Lucock family, who seem to have provided lots of churchwardens and parish clerks in the 18th and 19th centuries, but the great majority of graves here are on the north side of the church. As fine a vista the south side is, the same cannot be said of the north side. Here, there is no flushwork, no detailing; all is cement rendered, including the clerestory. Heavy buttresses bolster the wall, and the heating system pipes and chimneys abound. It is as if you have stepped behind a film set to discover the deus ex machina. As usual with a south-western tower, you enter beneath the bells. 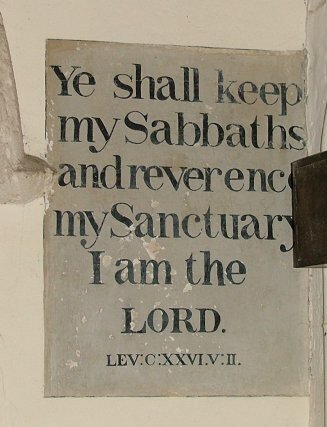 At the time the tower was rebuilt, the church was decorated with the heavy-handed quotes from scripture that you still find nearby at Hemingstone. 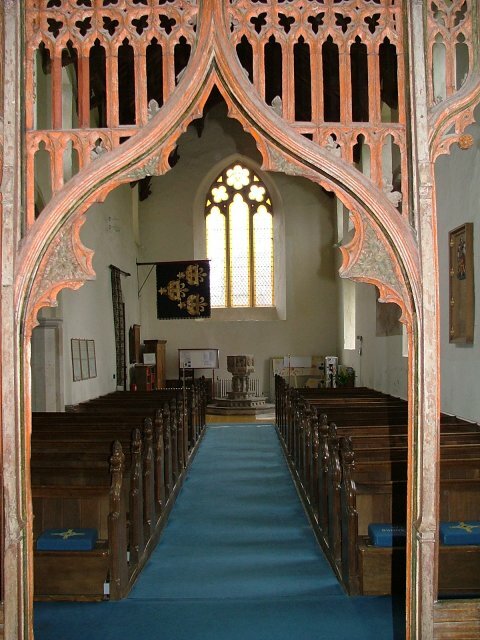 They've all gone here, except the one beside the 14th century south doorway which demands that we should keep the sabbath and reverence the sanctuary. You step through into light. 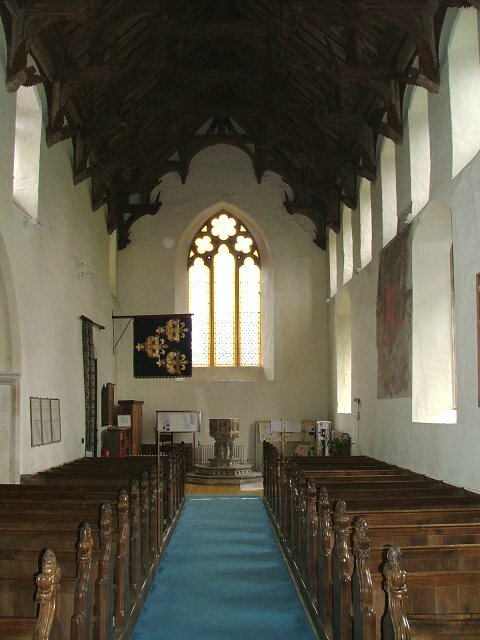 This is one of the benefits of a tower on the south side of the church; the large west window can flood the nave with light. 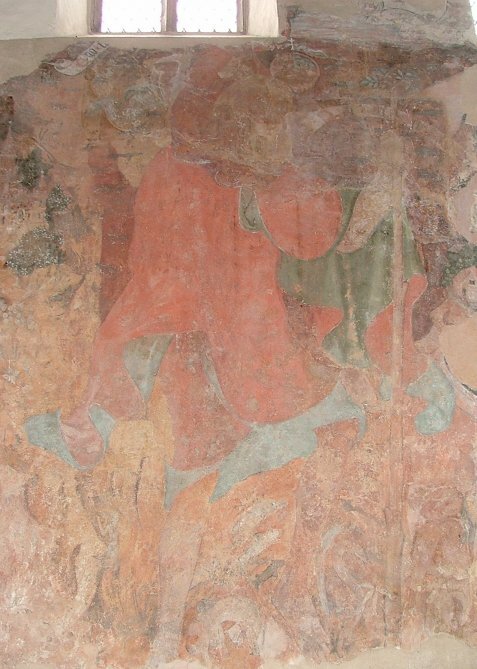 Directly opposite is one of the most striking St Christopher paintings in East Anglia; it was not uncovered until the 1950s, and so has not undergone the dubious benefits of a Victorian restoration. The Saint's red coat is rich and splendid, and the water he steps through abounds with life; three fish leap over two courting eels, while five more fish kiss beyond. There is even a mermaid. Buildings stand on either bank, and the fecundity is so infectious that leaved branches are sprouting from the top of the Saint's pilgrim staff. 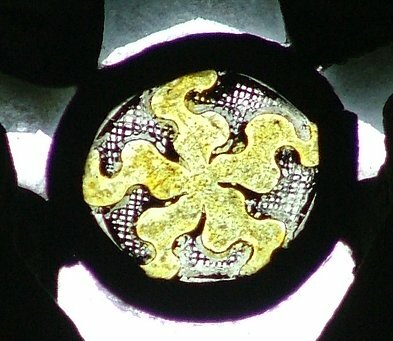 As at Creeting St Peter, there are scroll inscriptions. Interestingly, the 15th century clerestory cuts through the head of Christ, adding more fuel to my theory that many wall paintings were actually whitewashed during a kind of proto-Reformation in the 1400s. At this time, orthodox Catholic doctrine was being asserted by influential families on behalf of the Church in the face of the superstitions and private devotions of the common people. 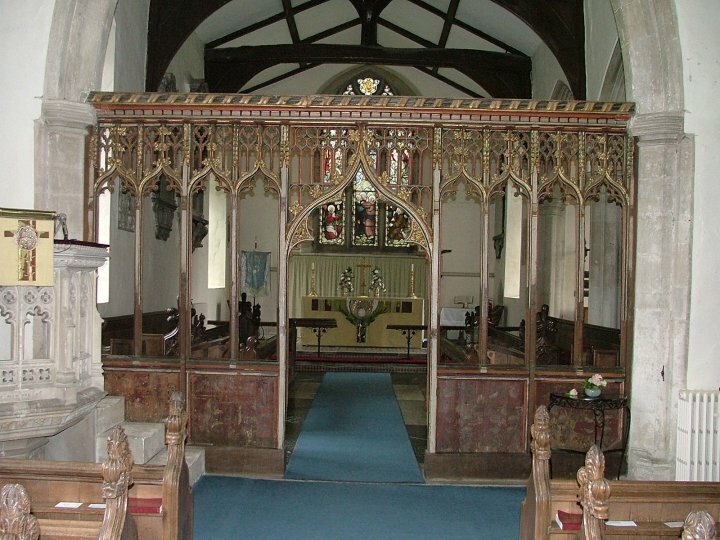 Hence, the erection of bigger and bolder roodscreens, the installation of seven sacrament fonts, and bench ends that depict the sacraments, virtues and vices. Ironically, it was these same influential families who would be championing protestantism a century later, as the secular power within the strong nation state that they had secured eclipsed the cultural reach of the Catholic Church. Perhaps without the magic it no longer gripped their imaginations. The St Christopher is spectacular, but there are two other wall paintings here that are of even greater interest and significance. 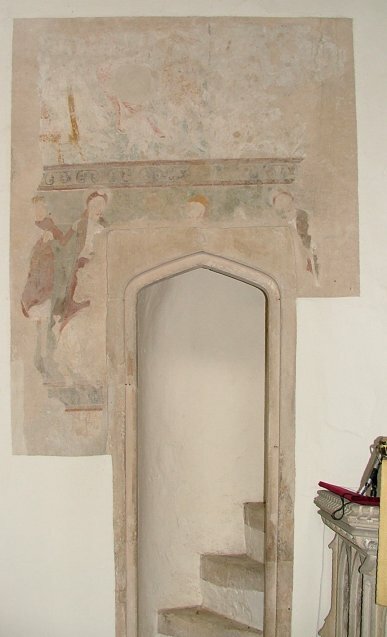 One appears to be the eastern end of a frieze, and is located above the entrance of the roodloft stair doorway in the north wall. It appears to show a man with a nimbus halo being presented by a man with a sword to what seems to be a seated figure. It may show Christ being taken before the Jewish high priest, and thus be part of a passion sequence; it could also conceivably be part of a Saint's martyrdom. Its position is interesting for several reasons. Firstly, it is unlikely to be the final frame in a story, so being at the east end of the north wall it would be at the midpoint of a sequence stretching either clockwise or anti-clockwise around the building. 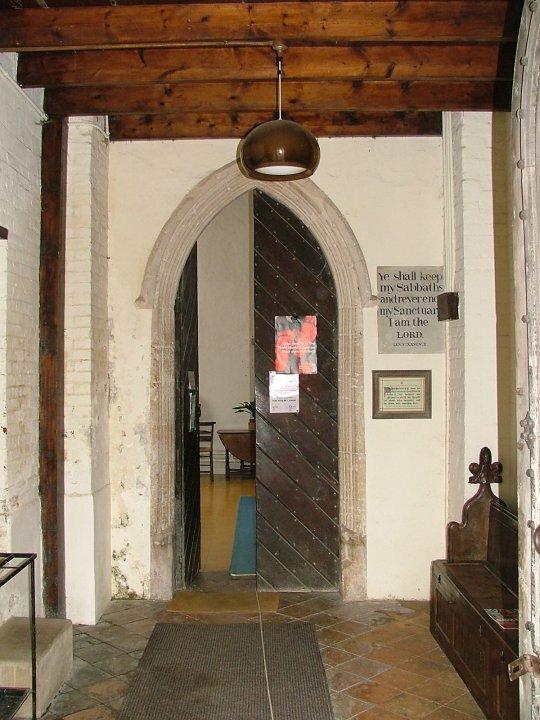 Secondly, it is in a 13th century style, but has been punched through by a late 14th century roodloft stairway entrance. What does this suggest? The painting dates from the great artistic flowering which would be cruelly dashed by the Black Death of 1348, when about half the population of East Anglia died. The doorway is cooller, more rational than it would have been half a century earlier. Was this the start of the proto-Reformation I suggested earlier? And why was it built here? 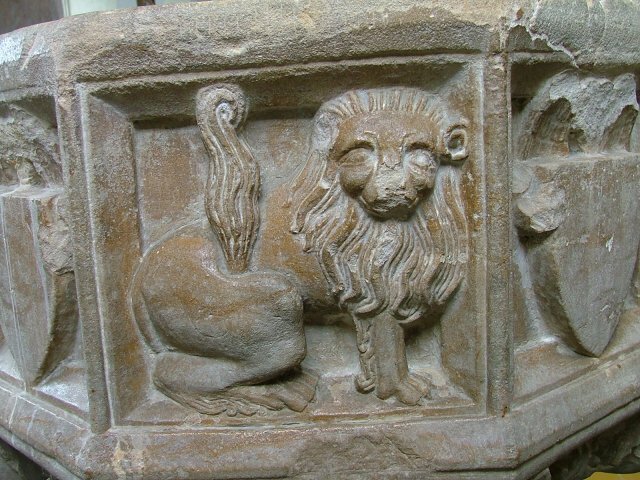 Perhaps it happened at the time the south aisle was built. The final wall painting is the most significant of all. It is on the southern side of the chancel sanctuary, which you may think is a very unusual place to find a wall painting, and you'd be right. It was actually found under the St Christopher, part of which was carefully lifted off and the painting beneath removed. It was then reset here. 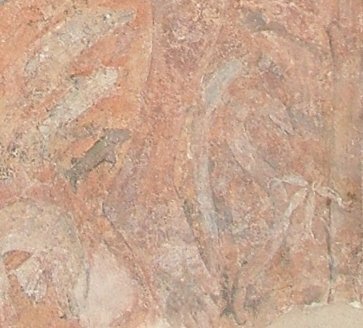 It is a tiny fragment of a larger painting which the guidebooks suggest shows St Margaret, the wing of a dragon behind her, a legend on a scroll. But it is actually much more interesting than that. At Melbourne in Derbyshire there is a larger painting which shows a group of women, one of them wimpled like the woman here, sitting and chatting. Above them, a devil is sitting and listening, and writing down what they are saying, presumably so that it can later be used in evidence against them. It is known as the warning against gossip, and this is almost certainly what we have a fragment of here. Why did anyone ever think it was St Margaret? Perhaps they mistook the wimple for a helmet. Click on the small images below to see the other wall paintings enlarged. 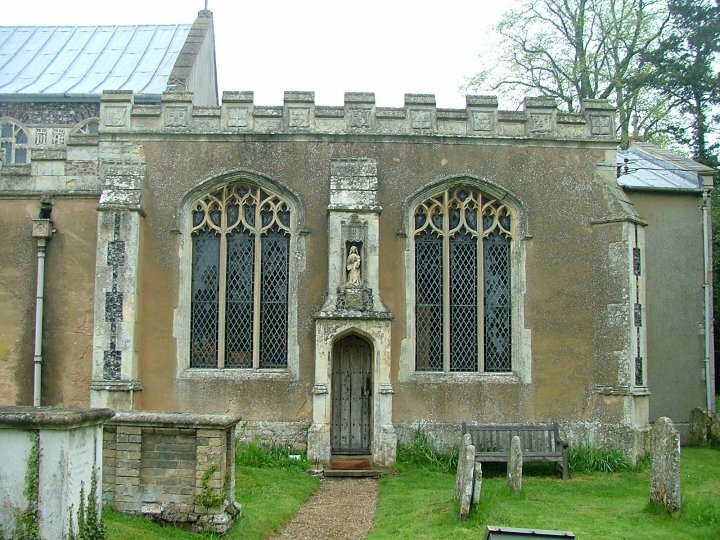 St Mary was one of many Suffolk churches restored by Edward Hakewill, who actually lived nearby. He let it off remarkably lightly, although it should be said in the church's defence that he did die during the restoration here. 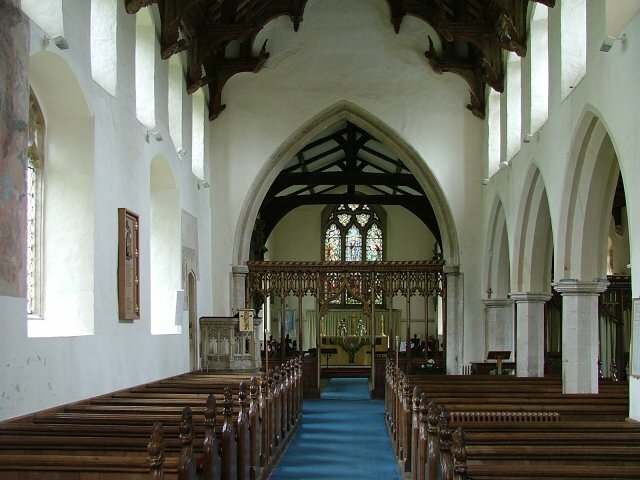 Otherwise, the planned north aisle would have been built, and we would have lost all the wall paintings for ever. 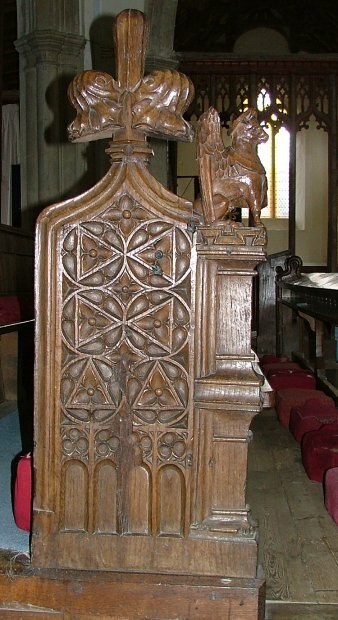 Before he moved on to better things, he replaced all the seats - those in the nave and aisle are typically workaday, but the big choir stalls in the chancels are good, and retain medieval bench ends (although not the figures, which are his replacements). 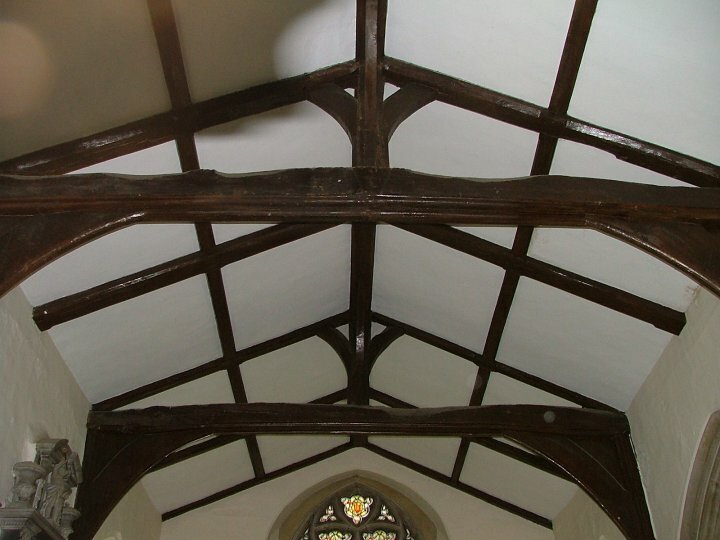 Thank goodness he didn't touch the rest of the woodwork, because this church contains what is generally felt to be the best of the smaller double-hammerbeam nave roofs in the county, as well as a beautiful rood screen and parclose screen, side by side. 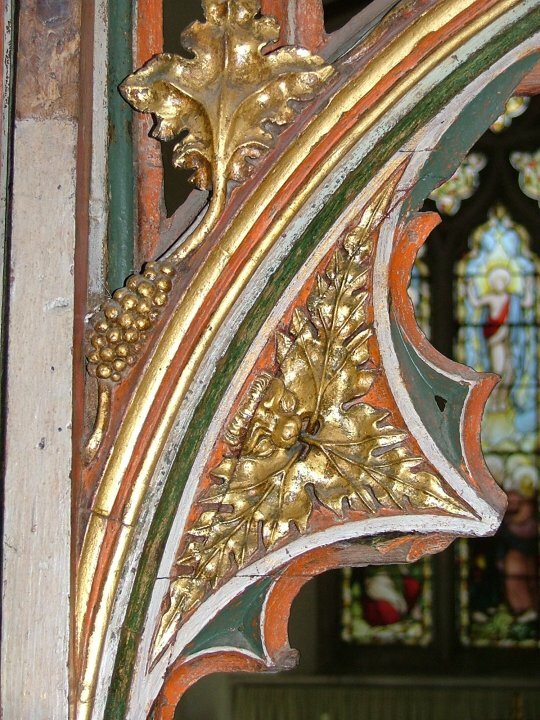 All three have been restored since Hakewill's time; the green man in the crocketting to the left of the entrance arch of the rood screen seems as fresh as if he emerged from the woods yesterday. 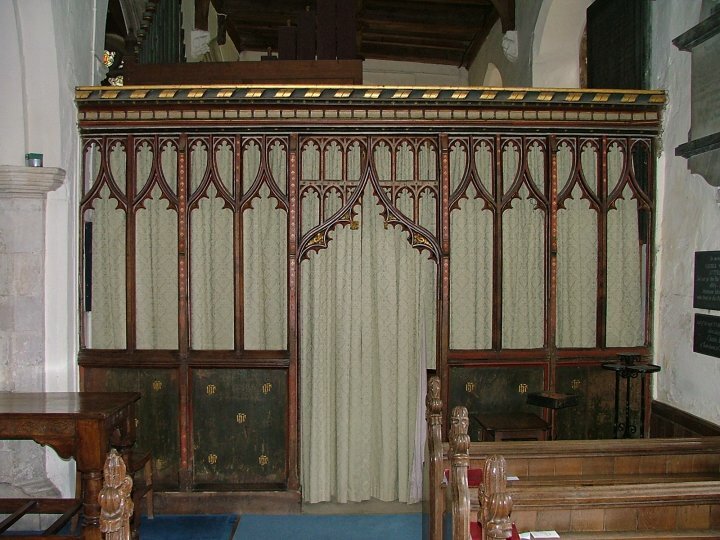 There are sacred monograms on the panels of the parclose, and it is worth pointing out that this screen is 150 years older than the chapel beyond it, so there must have been something there before. 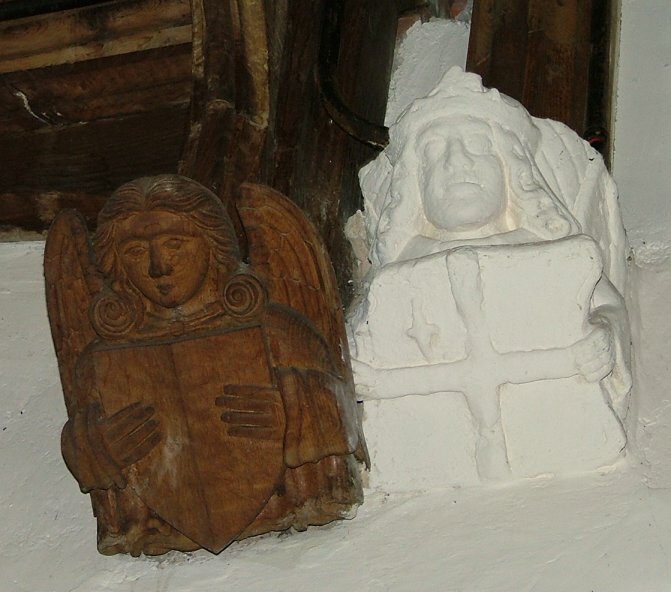 Look up, and you can see the wooden angel corbel of the aisle and the stone shield-bearer corbel of the chapel, a century and a half apart, squatting side-by-side. 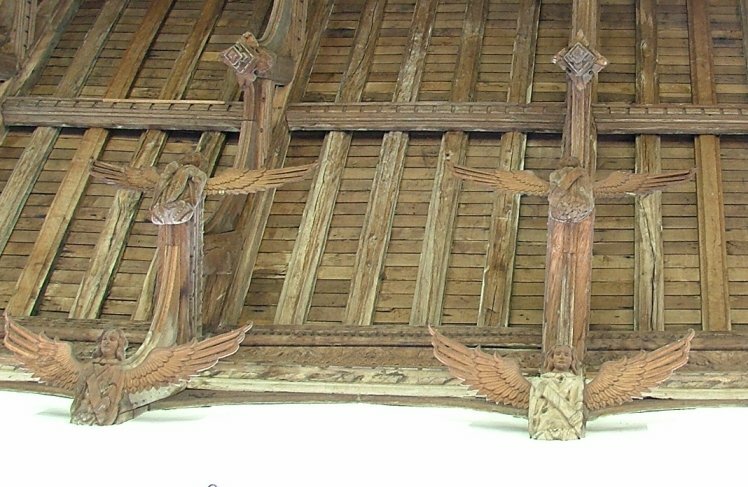 Look up further at the nave roof, and you can tell which are the replacement heads and wings on the roof angels because the 19th century oak has not faded to the colour of its 15th century predecessors. 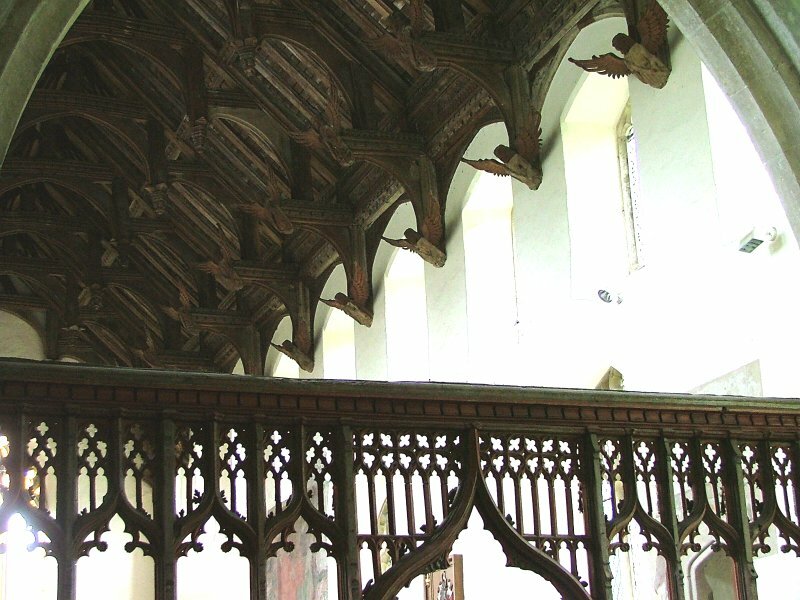 There are more than sixty angels, on the lower and upper hammerbeams, and actually under the spine of the roof itself. 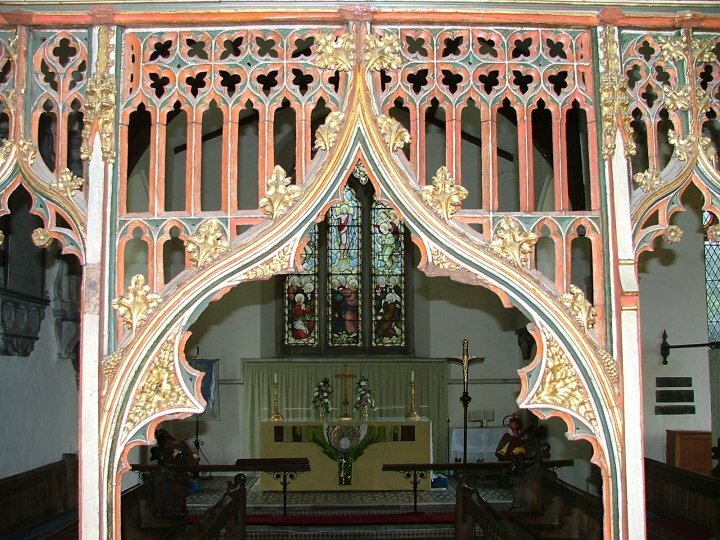 How glorious they must have looked in the 15th century when, full of colour, they hovered together above the people of Grundisburgh. What a vision of heaven that must have been. For centuries they sat in silence, headless and wingless, as part of the puritan project to turn the English into a serious people. Now at last they have taken flight again. 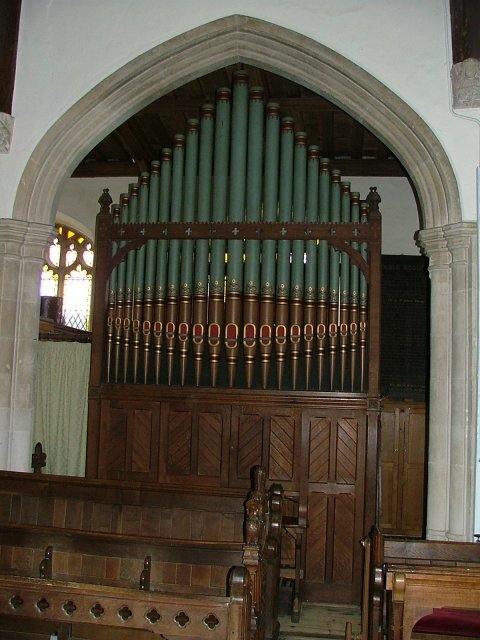 Stepping through to the chancel, you'll see that the medieval crossbeams are still in place, and the pretty pipe-organ has been sandwiched into the Wale chantry. After the high drama of the roof and screens, and the sobering effect of Hakewill's choir stalls, the sanctuary seems very middle-brow for such an interesting church; but Isobel Clover's super altar frontals distract from the insipid east window. There are some interesting memorials here. All the church's brasses have been moved to the end of the south arcade. This is a controversial practice, because although it allows them to be seen and protects them from being walked on, it leaves them defenceless in a fire (floor mounted brasses don't melt). 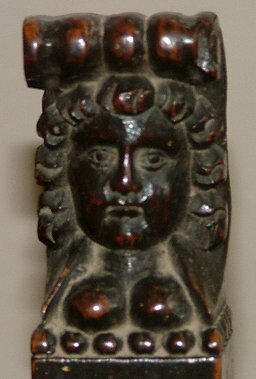 The figures here have been lost, presumably to collectors, but the inscriptions survive, and are mounted one above the other. 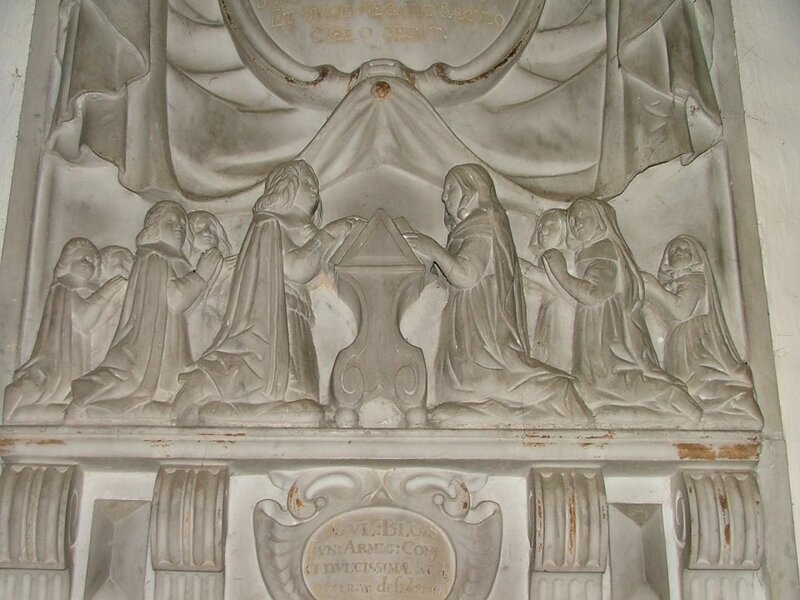 The top two are for families that we have met elsewhere on our travels, and it is fascinating to see them together because they are two of Suffolk's most famous recusant families - that is, those who refused to renounce the old faith at the time of the Reformation. 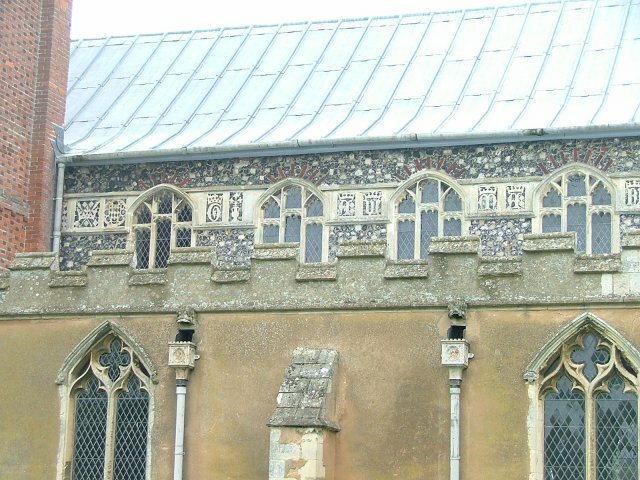 This failure to conform to Anglicanism cost the Sulyards of Haughley Park at Wetherden their estate, but the Mannocks soldiered on at Gifford Hall at Stoke by Nayland, maintaining a Catholic priest throughout the penal years and providing one of Suffolk's first Catholic chapels at Withermarsh Green when Catholicism was at last decriminalised. 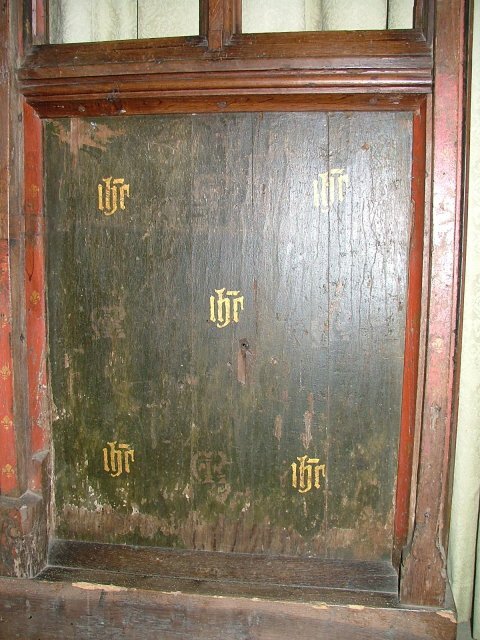 On the two brasses here, we catch up with the families some two generations after the Reformation; the connection between them is that Anne Manocke (1610) was the mother-in-law of Thomas Suleyard (1612). 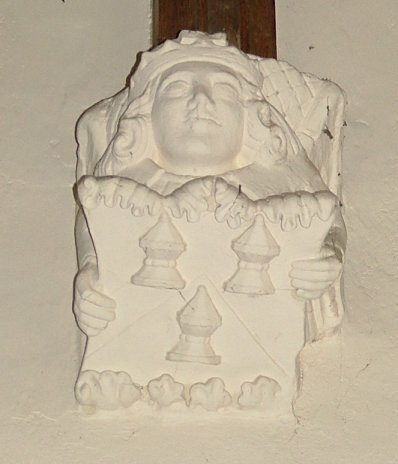 The Sulyards were particularly loathed by the puritans, and William Dowsing seems to have taken a peculiar pleasure in mindlessly defacing the Sulyard memorial at Wetherden. 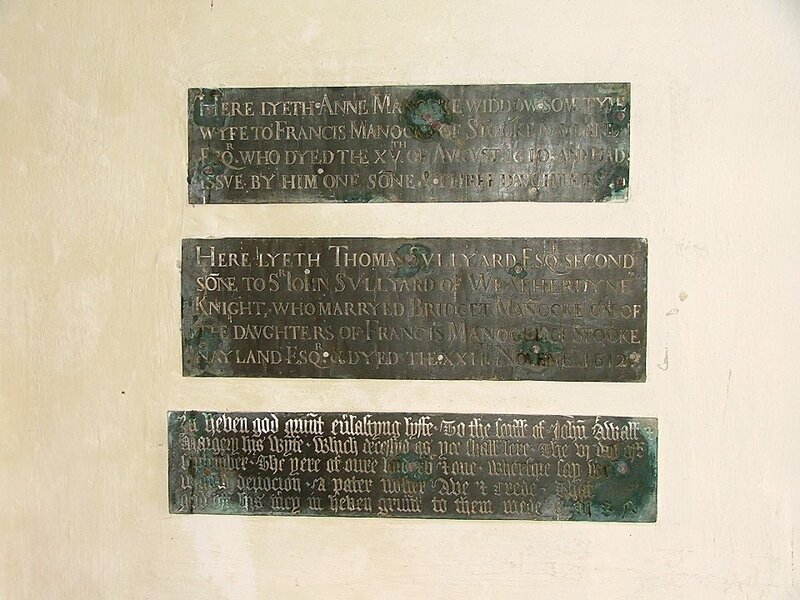 The third brass dates from a century earlier, and is for Thomas and Marjorie Awall. 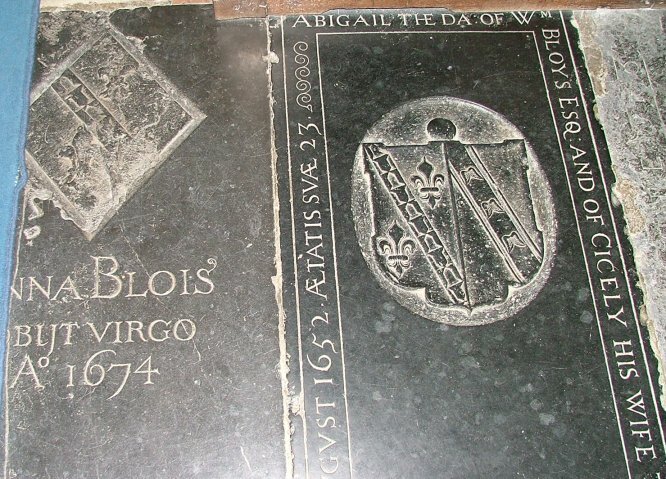 The big name of the parish in the 18th and 19th century was Blois, and their ledger stones pave the chancel, their monuments line the wall. One of the ledger stones gives the date as January 1692/3, a reminder of the time when the new year began on the first quarter day, March 25th. 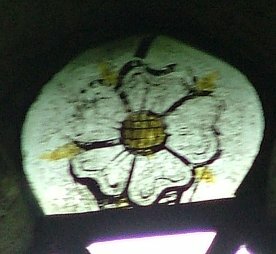 In pre-Reformation times this had been the Feast of the Annunciation, but until well into the 18th century it remained the day that financial transactions were marked from, and even now the financial year begins at the start of April, twelve days being lost when England adopted the Julian calendar. 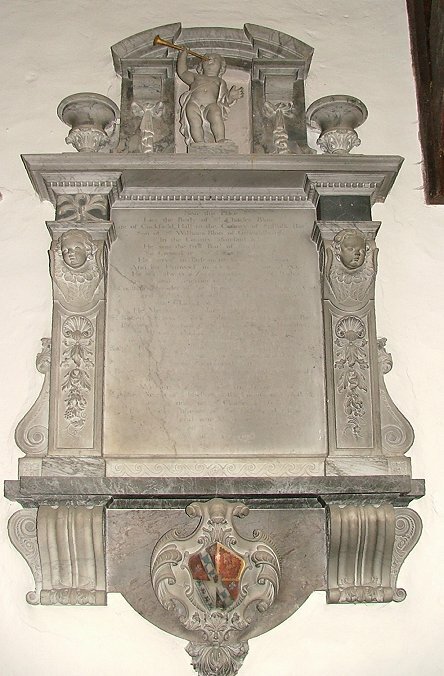 On the wall, there are three large Blois monuments to Martha (1645), William (1658) and Charles (1738). Martha's is the best, the kneelers at the bottom full of puritan piety, all with their own characters as if drawn from the life. William's is more sober, but Charles's is positively baroque. William is an interesting character. He was a staunch puritan, and a member of the Suffolk committee for the prosecution of scandalous ministers under the Earl of Manchester. These were the puritan thought police who persecuted theological liberals, sometimes hounding them to their deaths. 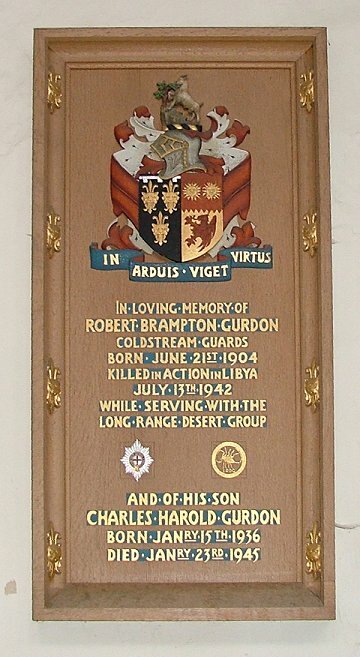 This might suggest that Grundisburgh was a puritan parish, and perhaps it was by the time he'd finished; but in fact at the start of the Commonwealth period he was responsible for the ejection of Edward Barton, the Rector here. Barton was charged with being an absentee minister, only visiting his parish once or twice a year, which doesn't seem unreasonable, although he was also charged with having 'an infirme body & noe audible voice'. Liberal priests were usually charged with drunkenness and consorting with prostitutes, of which there seem to have been a good number in 17th century Suffolk, but perhaps Blois felt he had all the evidence he needed here, or Barton was simply genuinely lazy. 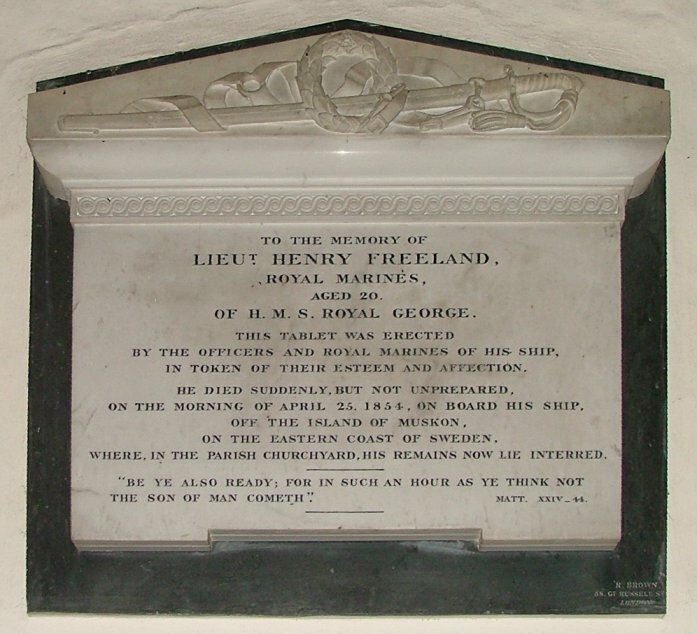 Elsewhere in the church are a wooden plaque to Robert Gurdon, killed in the desert in WWII, and a fascinating memorial at the west end of the south aisle to Henry Freeland, who died aged 20 on HMS Royal George near Sweden in 1854. We are told that He died suddenly, but not unprepared, and that it was in the morning of April 25th, off the island of Muskon Where, in the parish churchyard, his remains now lie interred. Interestingly, I visited here the week of the 150th anniversary of Henry Freeland's death, and apparently the Swedes had made a big thing out of it; there had been a commemorative service on Muskon, and the Rector of Grundisburgh had written something for the memorial programme. The massing of the western European fleets off of Sweden during the Crimean War was the single biggest ever assemblage of warships seen in the Baltic, and Freeland's death became a symbol of the interdependence of England and Sweden. 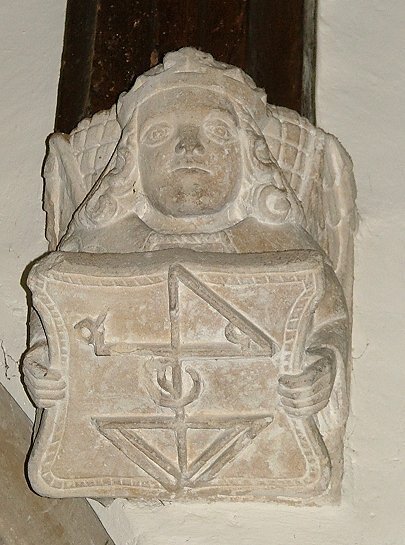 He died of an asthma attack, by the way, just like his father, the Rector of neighbouring Hasketon. 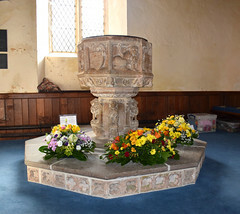 Looking back towards the west, a vast flag with three stylised lions hangs above the font. 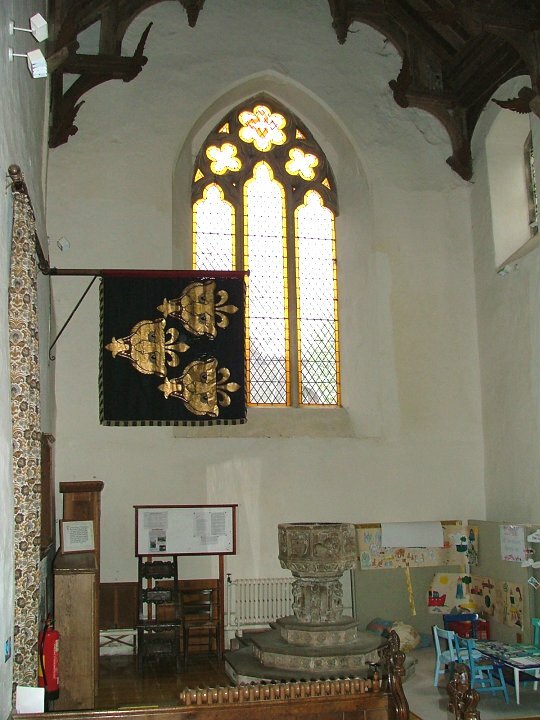 This is a Garter banner, and formerly hung at Windsor above the seat of Knight of the Garter Baron Cranworth. It now hangs here as his memorial. 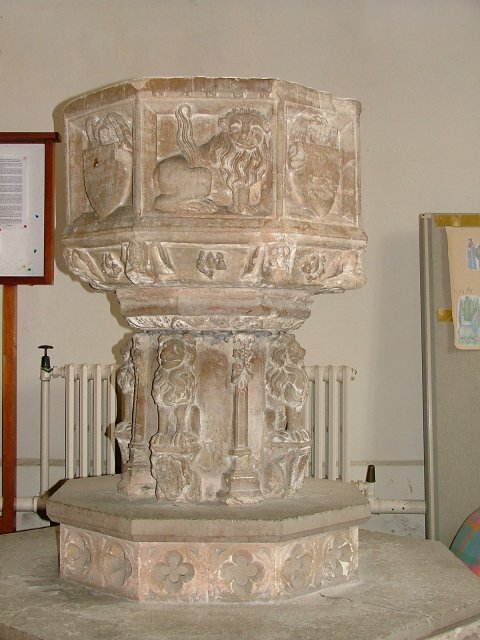 When I visited in 2016, I found that the font on its large base which had been previously crammed into the space at the west end below it has now been moved into the south aise. 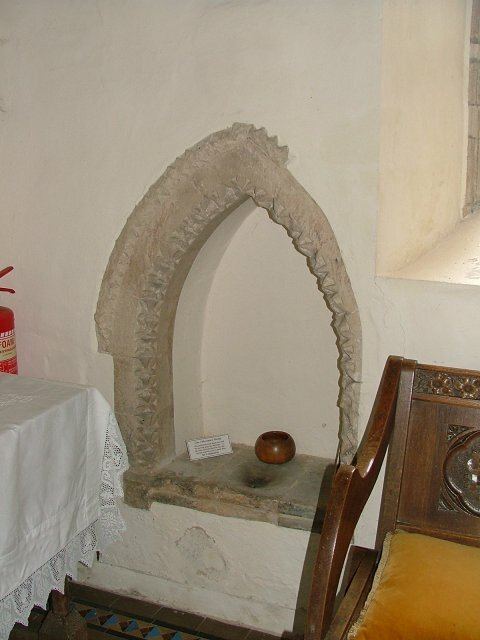 One detail that intrigues me, and I don't know the answer to; in the Wale chantry, there are two corbels, one above the other; about a metre and a half separates them. Any ideas? Grundisburgh is so close to Ipswich that many of the people who live here must be commuters, but it has retained a self-sufficient air, and this is not merely the result of County Council planning policies. 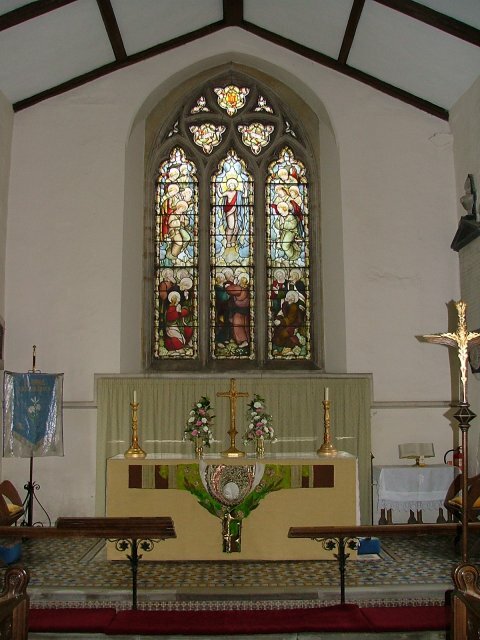 The setting of St Mary gives the place a heart - this is a proper village, not just a parish, and as such is a community, with a fine if ideosyncratic building as its touchstone. As I stood watching the villagers wandering around the busy May Day fair, I thought of the ghostly abandoned villages of the Norfolk battle zone, once equally full of life, and thought that the people of Grundisburgh were more fortunate than they knew.